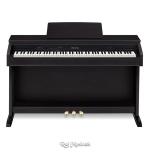 Casio AP-260 BK Cleviano Digital Piano with 18 partly new tones and the new „Concert Play“ function, music making becomes a real experience on this first-class cabinet pianoforte. The elegant design is emphasised by the „Ivory Touch“ keyboard with its ebony and ivory finish. A must-have for the ambitious beginner.